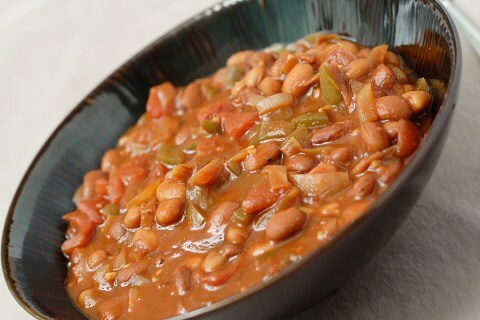 Note: If you can’t find dried chiles, try substituting 1 cup of vegetable broth plus a tablespoon or so of chili powder. Increase the chili powder to taste. Remove and discard the stems from the chiles. Place them in a small saucepan and pour the water over them. Bring to a boil and simmer for 15 minutes. Allow to cool. Put the chiles and the water into a blender and puree until well-blended. Pour into a strainer, pressing lightly on the pulp to get out all the flavor. Throw the pulp away and reserve the liquid. In a large non-stick pot, sauté the onion in a little water (1 tablespoon to start) until it’s beginning to brown. Add the garlic, bell pepper, and a little more water and sauté for 3 more minutes. Add the reserved chile sauce, tomatoes, tomato sauce, beans, cumin, oregano, black pepper, and paprika and bring to a simmer. In a small bowl, mix the cocoa powder with 1/4 cup hot water until it is well blended. Add it to the chili. Taste for seasonings and add salt and red pepper to taste. If it seems bitter add sugar. Cook on low for at least 30 minutes to allow flavors to blend.